Are you a health conscious individual? Do you shop at GNC? If so you’re in luck. 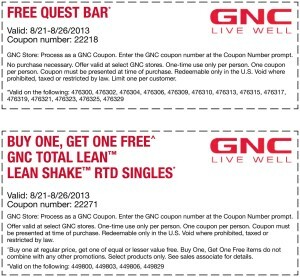 You can take advantage of this MULTI-DISCOUNT GNC COUPON SPECIAL You can enjoy a free quest bar and a BOGO (Buy one, get one free) GNC Total Lean Lean Shake Singles. This is a great value because if used properly, you will be getting two free items instead of one. That’s awesome! 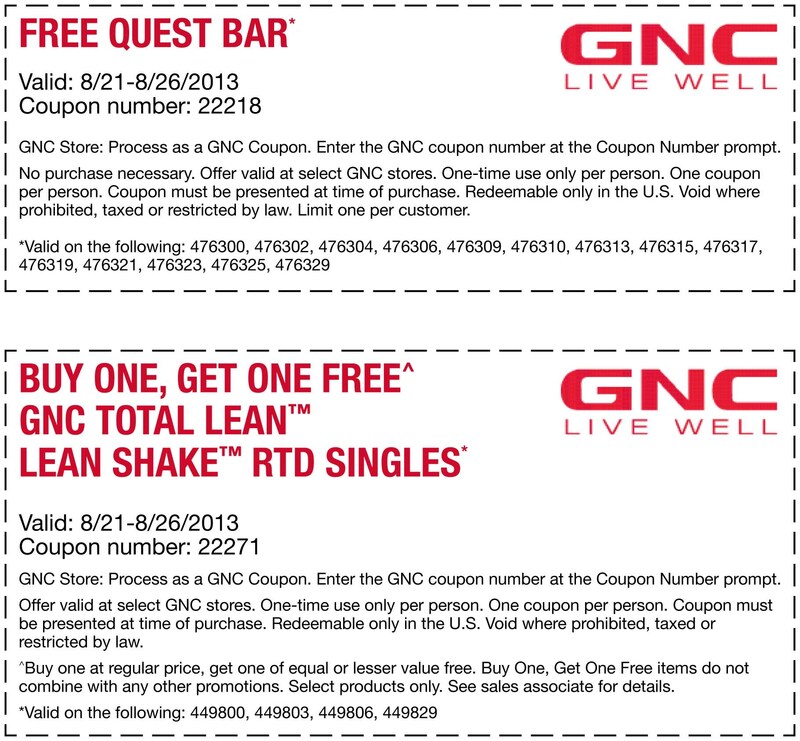 As you know, healthy items tend to be on the pricey side, so it’s advantageous to use coupons from GNC if you have them. You can’t beat having a great deal. Hands down. Get on over to GNC and see what else they have to offer. GNC is known for having everything you could possibly think of when it comes to being healthy. Vitamins, supplements and more. All you have to do is go there and talk to their knowledgeable associates and you’ll be on your way to having what you need when you want it. Although GNC has competitors, they have been around for a very long time, which speaks to their quality of products and service. If you ever have questions, they can answer them – in detail. That’s important. You want to make sure, especially if you’re thinking about taking supplements or starting a new vitamin that you have all the information on the product that you need to make a well-informed decision. They don’t wonder why you’re asking but instead encourage it. That’s great customer service. 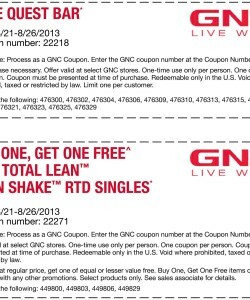 Get on down to the nearest GNC and get your free items today.